Understanding your piping system requirements and basic expansion joint functions are keys to achieving optimal performance. 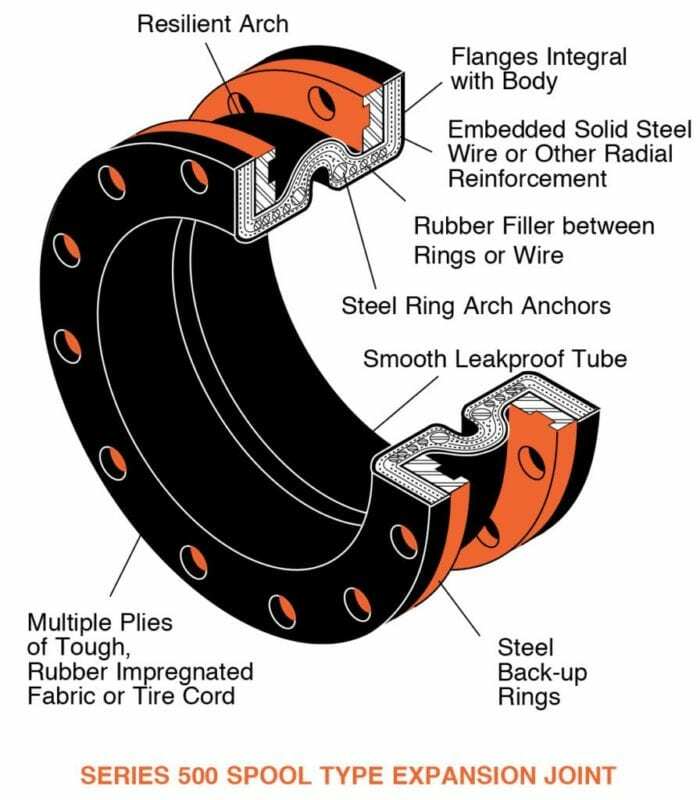 Elastomeric expansion joints serve many functions in modern piping systems. They offer significant advantages over alternatives such as metallic expansion joints or expansion loops. Unfortunately, rubber expansion joints are often misapplied. Design and maintenance of an optimal system requires an understanding of both the basic functions and the requirements of the piping system. The main purposes of an elastomeric expansion joint are to reduce noise and vibration, and accept thermal movements. They reduce noise and vibration by creating a discontinuity between pipe materials. Noise and vibration theory explain that a rotating piece of equipment such as a centrifugal pump will create noise and vibration via its unbalanced force. The frequency and amplitude of vibration depends on the speed and type of pump. The elastomeric expansion joint acts to break up this disturbing frequency and absorb the energy. 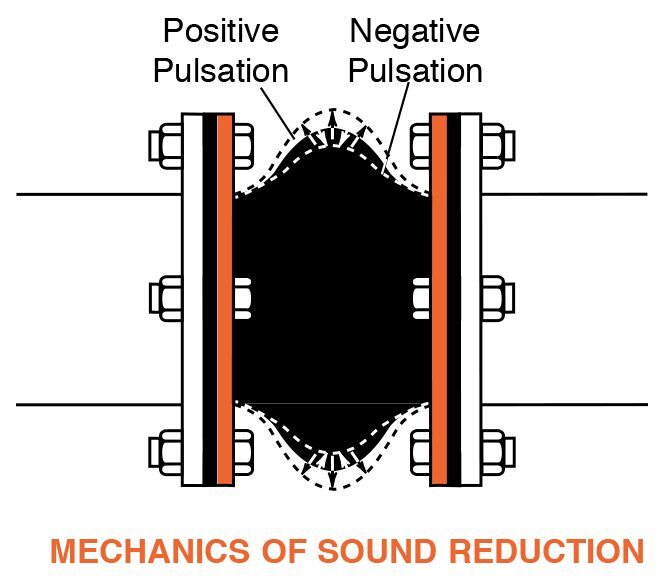 This minimizes the transmission of noise, vibration and stresses into the adjacent piping or equipment. The flexible body of an elastomeric expansion joint accepts piping thermal movements as well. Thermal movements are an important consideration in any system design. Depending on the change in temperature, material and length of pipe, the movements can be large enough to generate forces that will quickly exceed allowable pipe stresses. 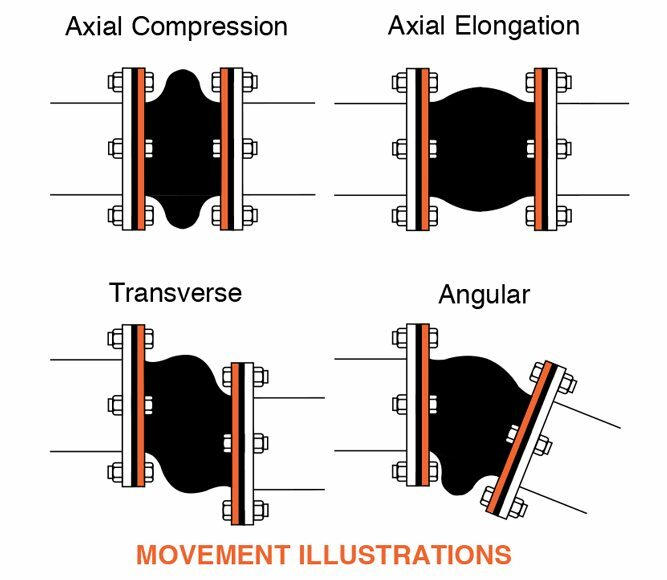 Expansion joints allow for these movements in compression, extension, lateral, torsional and angular directions, and thereby protect the piping. Elastomeric expansion joints are also widely used because of their excellent resistance to shock and wear. Shock and bending loads are generated in piping systems by waterhammer, pressure surges and seismic events. Expansion joints work as shock absorbers to accept these forces and displacements and thus protect the system from damage. In addition, the elastomer material provides excellent resistance to wear and cyclic loading, particularly compared to its metallic counterparts. The development of synthetic elastomers and fibers enables joints to be designed that handle pressures of 350 psi and temperatures of 400°F, conditions that would have previously prohibited the use of rubber materials. An elastomeric expansion joint consists of the tube, carcass and cover. The tube is a leak-proof lining which protects the carcass from contact with the fluid medium. The tube material is selected to withstand the temperature, chemical and abrasive characteristics of the fluid. Chemical resistance guides are useful in selecting compatible elastomeric materials. A full range of elastomers is available including Natural Rubber, Chlorobutyl, Nitrile, Neoprene, EPDM, Viton and Teflon. The carcass is designed to handle the system’s fluctuating movements, pressures and temperatures. Typically, multiple plies of rubber impregnated Polyester or Kevlar tire cord are used in conjunction with steel reinforcement to achieve the necessary design. The resilient arch is primarily designed to handle the movement requirements, but it also has to withstand the temperature and pressure requirements. The steel rings at the base of the arch are particularly important to prevent arch broadening from the continuous pressure. Arch broadening or migration results in premature joint failure. The cover, like the tube, acts to protect the carcass. The cover material is selected for its resistance to chemicals, oil, sunlight, acid fumes or ozone contamination, depending on the environmental conditions. There are many types and arrangements of expansion joints performing various system functions. In the case of retrofit offset applications, our company engineers take field measurements and then design and fabricate custom-built expansion joints. More typical arrangements include straight spool pieces, both single and multiple arched; reducing joints, both eccentric and concentric; and simple sleeve types and flanged hoses. It is important to use control rods to protect the expansion joint when the piping system is not adequately anchored. Pressure forces can quickly stretch the joint beyond its allowable limit and cause failure. This can be avoided with control rods that are set with clearances within the allowable limit of the joint. 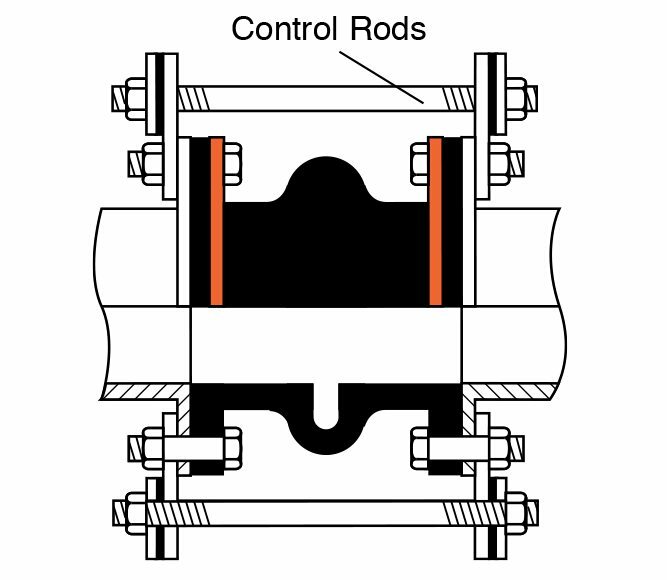 Control rods can not, however, protect the expansion joint from thermal movements that exceed the design criteria when the pipeline is properly anchored. Thermal forces are considerably greater than anything the rods can tolerate because the cross section of the steel pipe is greater than the control rods. If the pipe thermally contracts beyond the expansion joint’s allowable expansion limit, both the control rod and the expansion joint will fail. This type of failure is often incorrectly attributed to manufacturing defects in material or workmanship when it is actually caused by over-extension. Careful attention must be given to selecting an expansion joint that will accommodate the predicted thermal movements.